At YCIS, middle school is all about leading, learning, stepping up, taking a chance and finding what you love. Students discover their passions, express their voices, and build meaningful relationships as they gain independence and confidence. 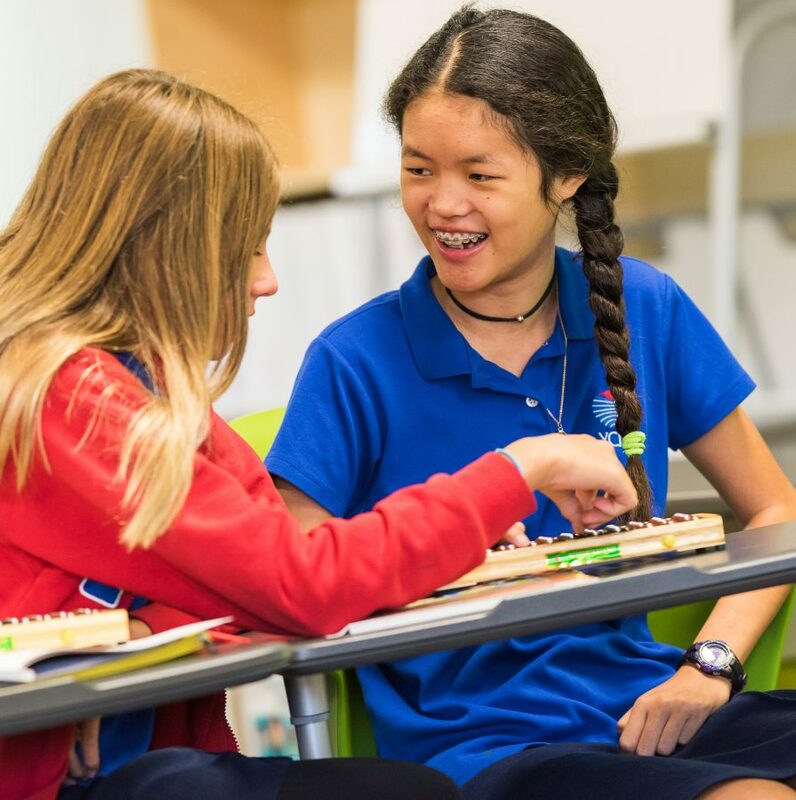 In our K-8 community, middle schoolers are the natural leaders, taking the reigns on social and community projects, performances and being the ultimate role models and mentors for younger buddies – socially, academically and emotionally. Within a safe, supportive learning environment, middle schoolers grow as compassionate and ethical agents of change ready for a global world. Within a caring and supportive learning environment, students gain skills to be increasingly self-directed in their learning by setting goals, taking responsibility for their work and reflecting on their growth. Students are comfortable collaborating, experimenting, testing out ideas and learning from their mistakes. They are concerned about the world around them and take initiative to make a difference. Through authentic and meaningful projects they help to create with their teachers, students use and extend their skills across disciplines: whether it is a bilingual puppet show of Romeo and Juliet or setting up a pop-up shop to fundraise for wildfire victims. When students are comfortable, they are confident. With small class sizes, and teachers and classmates who know them well, students feel safe to exercise their independence. Teachers mentor students as they explore new lab techniques, participate in seamless and thoughtful technology integration, conduct comprehensive research, discover meaning in math, employ sophisticated writing processes, express themselves creatively through the arts, and think critically from a variety of perspectives. Partnering with students from the neighboring German international school, YCIS students widen their social networks with lunch mixers, shared holiday celebrations, service projects, sports activities and fall and spring dances. Each day begins with a morning discussion focused on social-emotional growth. Students study math, science, humanities (English/history), and Chinese daily. They also have music, art, PE, engineering, passion projects and 21st century skills classes during the week. The day includes breaks in mid-morning and at lunch. At YCIS, we believe a strong mind balanced by a kind heart and an excellent character is a recipe for success. Our well-rounded academic program ensures students are challenged as critical thinkers, problem solvers and leaders, while finding their voices, pursuing their passions and creatively expressing their unique selves. An exploration of great literature in a variety of genres encourages students to develop their abilities to critically analyze texts and to coherently express their ideas and arguments verbally and in writing. As students develop competence in the writing process and how techniques are used to achieve different purposes, they grow as skilled writers producing increasingly complex essays and research papers. The Reading & Writing Project combined with history/humanities interdisciplinary projects further extend students’ analytical abilities. Students are empowered to inquire, to think critically and to solve problems creatively in mathematics. 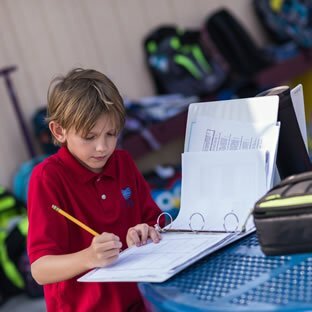 They master mathematics concepts, computational skills, problem-solving, and application of mathematics in daily life with project-based learning. The Singapore Math in Focus program is used for Grade 6, while Pre-Algebra and Algebra are taught in Grades 7 and 8. Students learn science by doing science. With access to a science lab and outdoor exploration at Stevens Creek, students collaborate in experiments and other projects. The research-based FOSS science curriculum promotes collaborative, hands-on learning and gradually builds students’ skills in the scientific process: to observe, to think, to test and to explain. Science integrates reading, writing, and mathematics, and extends classroom learning outdoors. Engineering and design projects fuel student creativity, problem-solving and critical thinking. In History, students explore what influences their ideas of history while writing and presenting critical analysis of information using various technologies, media, and methods of presentation to assume the roles of both teacher and student. Students look for patterns in history and identify conflicting points of view. They engage in active discussion, debate, and simulations as they analyze social issues. The history curriculum covers World Geography and Cultures, World History and US History. Grade 8 students study Chinese History in Mandarin as a foundation for AP Chinese in high school. Linked to students’ study of US government and history is an educational trip to Washington D.C. which alternates with other international trips. 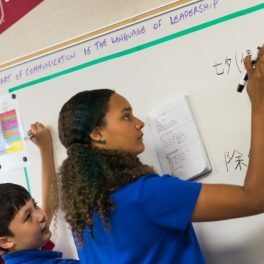 A cornerstone of the YCIS educational journey, the Chinese Studies program builds fluency in listening, speaking, reading, and writing in Mandarin and a deeper understanding and connection to Chinese culture and history. The program is designed to meet the needs of beginner to advanced learners through use of authentic materials and meaningful learning approaches. Teachers use a broad range of resources including leveled textbooks, enrichment materials, and online learning platforms along with creative projects. Students are assessed for proficiency annually with the AAPPL test of the American Council on the Teaching of Foreign Languages (ACTFL). Students also have opportunities to challenge themselves by participating in competitions for Mandarin speech, calligraphy, idioms and art. Additional classes taught in Mandarin include Art (Grades 6 to 8) and Chinese History (Grade 8). Highly valued in both eastern and western cultures, the Arts are an essential part of the YCIS curriculum. The Arts build cultural awareness, discipline, and creative self-expression while encouraging the development of mental capabilities that foster flexible, divergent, original, fluent and imaginative thinking. Students are exposed to a variety of artistic styles from around the globe. Middle school students may choose to attend Art or Music classes with specialist teachers each trimester. They may also join the after school orchestra or choir. Healthy habits, movement and sports contribute to a lifetime of personal well-being. Physical education and regular recess times are an essential part of a balanced education and foster teamwork and sportsmanship. Students develop skills in a variety of sports with a certified PE instructor. The development of good character and a strong inner moral compass is as essential to success as academic excellence. Students are challenged to create their own inspiring journeys to have a positive impact upon the school, the community, and the world. They grow as leaders by working together to tackle social issues that are important to them through authentic project-based learning. They initiate service projects that are measurable, practical and meaningful and learn what it means to be a socially responsible citizen. Among their many activities, middle schoolers have provided free after school clubs for elementary students, visited senior centers to work on joint service projects, and led a fundraising campaign for wildfire victims. Middle school students may also choose to apply for membership of the National Junior Honor Society for additional opportunities to grow as leaders. Creativity, collaboration, critical thinking and communication are among the 21st century skills students develop through project-based learning. Class time devoted to pursuing passion projects, researching innovations and going on field trips to local companies to learn from experts supports students to apply and extend classroom learning while exploring future career possibilities. Whether creating videos, programming a robot, or preparing a presentation, students use technology to document, share, and celebrate work and learning. Chromebooks, iPads, interactive whiteboard projectors, subject-specific software, online learning platforms and other technologies such as a 3D printer offer students tools to enhance and expand their learning. Students are issued personal Chromebooks and use Schoology to track and submit assignments. YCIS students have ample opportunities to travel across town and across the globe to make connections and memories of a lifetime. Field trips bring classroom learning to life. In addition to enjoying local field trips tied to their curriculum, middle school students have the opportunity to visit Costa Rica to extend learning about biodiversity, Washington, DC to enrich their US history and government studies, or China on a student exchange to improve their language skills and learn about life in another country.